Today, the sister and I went to Akihabara (also called Akiba by the locals). We decided to get ramen for lunch (finally!) at a ramen bar 5 blocks from the station. A line was already out the door and wrapped around the shop! The menu on the wall was in Japanese, but a kiosk was used to take your orders, which had picture buttons! There was a button for ramen with pork, ramen with tons of pork, large ramen with pork, and large ramen with tons of pork. After we made our selections and fed the kiosk money, it spat out a receipt/ticket which is to be held onto. After we ordered, we sat on a bench (still in line/queue) against the wall of the ramen shop. The chef asked us to show him the receipt, which had a number specifying which ramen we ordered. Once I reached the end of the line, I waited until a seat was open and the counter space cleaned up, before taking over the spot. I placed the receipt in front of me, and was served my order not too long after! All customers ate by themselves, except for a couple at the end of the bar. My sister and I ended up not sitting next to each other. We didn’t bother to ask not only because we didn’t know Japanese well enough, but because we just wanted to eat and explore more of Akiba! TL;DR: 30 minutes in line/queue plus 10 minutes to empty out my (delicious) bowl of ramen for ¥720 was totally worth it! Tokyo style ramen typically features medium thick, wavy noodles in a shoyu soup flavored with dashi fish stock. 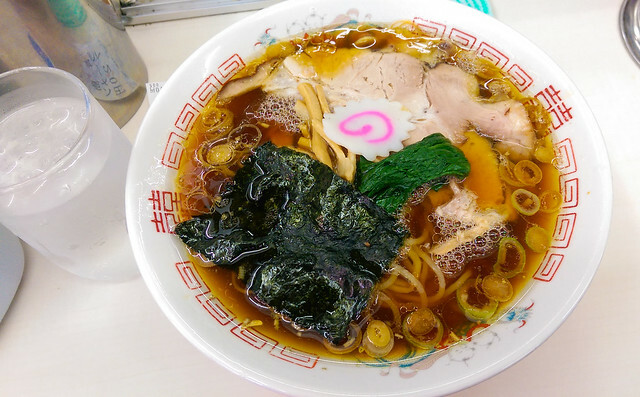 Tokyo Ramen are served nationwide and have become popular to the point that they are essentially the stereotypical shoyu ramen. Good ole’ Tokyo ramen is the most well-known and widespread style of ramen found in Japan and quite possibly the rest of the world. With a soup made from pork bones and chicken stock, Japanese dashi, shoyu tare, and curly yellow egg noodles, Tokyo ramen is, on so many levels the most “average” of ramen styles – from the amount of water used in cooking the noodles to their shape, their curl-to-length ratio, and the ingredients found in the soup. This traditional Tokyo style (shoyu soup, curly egg noodles, and a dashi of bonito or kombu) arrived from across the bay in Yokohama. It was quickly embraced as more “wafu”, or Japanese, style of noodles than the Chinese noodles from which it was originally descended. Many shops in the Tokyo and Saitama area, such as Taishoken Eifuku-cho, have taken this to an extreme, presenting ramen in a heavily dashi-flavored broth that is often strangely reminiscent of hot udon or soba soup.